For decades, the Congress has hosted the new prez on inauguration day at a luncheon in Statuary Hall in the Capitol. It requires a big catering operation with lots of last-minute food prep, large wait staff, groaning trays, clattering china. After Ronald Reagan's first inauguration, organizers decided they needed to erect a temporary partition behind the president's table to wall off the kitchen/service prep, and that's exactly what they did for Reagan's second inauguration and every inauguration since. But then they had a big blank, ugly partition wall behind the prez. Very untelegenic. What to do? They decided to hang a famous 19th century American landscape painting (Jasper Francis Cropsey’s “Autumn on the Hudson River,” 1860) for Reagan's 2nd Inauguration, and the partition wall has been similarly decorated by other famous American paintings every inauguration since. So what's going to hang on the partition directly behind Trump's hairdo? Why, "The Verdict of the People" by George Caleb Bingham, painted in 1855 and depicting a typical American election day in the 19th century. It's a large canvass crowded with many American faces, some celebrating, some mourning. Problem is, the Bingham painting celebrates the triumph of pro-slavery politics in the Kansas-Nebraska Act of 1854. 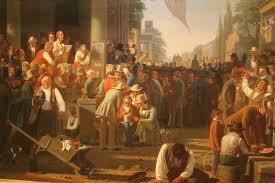 The people celebrating in the painting are Democrats, mainly a pro-slavery party in the Missouri of that time. The ones weeping are Whigs. The painter was a Whig. “Bingham is painting out of a great fear that popular sovereignty and the Kansas-Nebraska act will lead to an irreparable divide in the country,” says Adam Arenson, a Missouri historian. So the PEOTUS, who many find to be deep-dyed in the racist strain of American politics, will have a famous beware-the-racists American painting hanging literally over his head. Cool. Okay, I'm feeling some sympathy for Missouri Senator Roy Blunt, the schlub who chose the painting, begged the St. Louis Art Museum for the loan, and arranged for its temporary relocation to Statuary Hall. Sen. Blunt, as chair of the Joint Congressional Committee on Inaugural Ceremonies, thought of the painting back in July and asked the St. Louis museum for the loan. All those arrangements were made before the election, so Blunt had no foreknowledge of who would be honored at the luncheon. It was not a deliberate choice of painting topic. I suspect Blunt liked the title, "The Verdict of the People," for what that phrase means in a democracy. The verdict of the people is what it's all about. But I also suspect that otherwise Blunt knew squat about the historical and political message in the painting. Either that or he has no capacity for irony. He didn't know it would be Trump. He also didn't know that Trump would lose the popular vote by almost 3 million. The verdict of the people? Debatable. In the meantime, there's a small uproar going on about the painting, maybe especially in St. Louis, which went for Hillary while the state of Missouri went for Trump. Every time you see a photograph of Trump standing in front of that painting, you can have a quiet chuckle, because you know the history.